High impact durable case provides protection against falls. 4 integrated grounded outlets for up to 1500-watts of power. 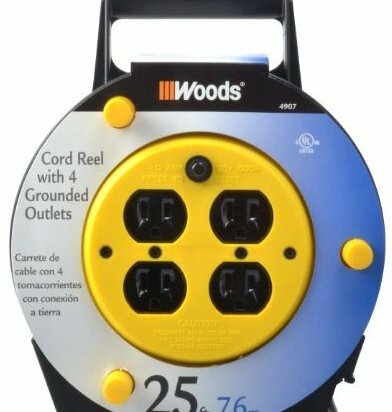 25-Foot of SJTW 16/3-Gauge extension cord with 12A circuit breaker. Easy to use comfort handle in top and rear of unit. Great for the garage - quality cord jacket provides protection against moisture, abrasion, oil and chemicals.